Instead of having more relaxation time nowadays, I appear to have less. I am fortunate to be working however, I am working awkward hours and getting back home late. When home I simply feel like collapsing in front of the TV because I would prefer not to invest lots of energy slaving in the kitchen. Some people feel that veggie cooking takes more time to get ready rather than the typical meat and two veg yet this is simply not true. A considerable amount of recipes on this blog can be arranged in around 30 minutes and quite a few of them can be prepared in even less time. Ready made gnocchi is a true time saver here but if you perfer the real McCoy then maybe consider investing in a potato ricer. Alternatively, you could simply spend 20 minutes mashing cooked potato by hand. Keeping the sauce ever so simple here saved on time aswell, just four imgredients: garlic, butter, Paremesan and pine nuts. 1. Cook gnocchi according to package instructions. 2. Melt butter in a large pan. Add gnocchi, minced garlic. Cook until gnocchi is golden brown in color. 3. Add the basil, lemon juice, pine nuts, salt and pepper. Continue stirring on heat for one minute. 4. 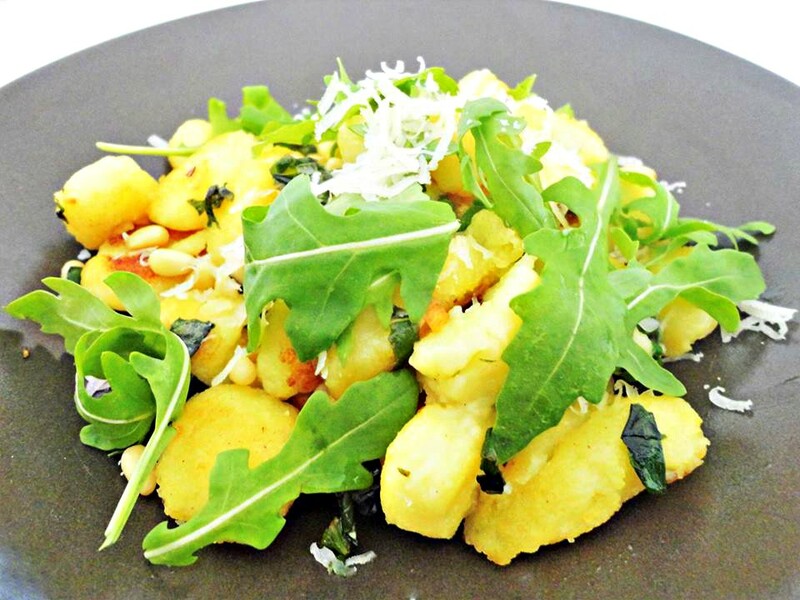 Serve gnocchi with some rocket leaves, grated Parmesan and a drizzle of the extra virgin olive oil.